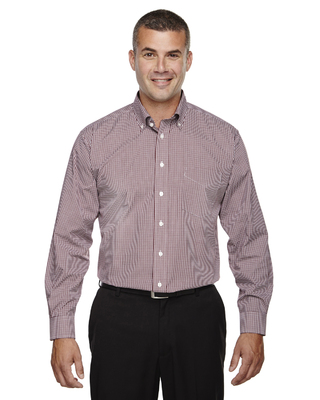 We offer all types of men's wait staff shirts from casual to very formal, many come with sleeve length choices for a better fit. A popular new color is brown. We now have suits, vests, and shirts in this stylish new color for your restaurant and banquet staff. 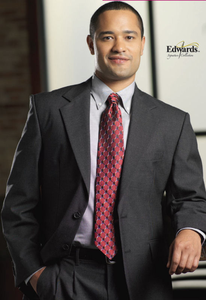 Formal or informal Sharper Uniforms has the right jacket for your occasion. Offering great style, fabrics and colors! 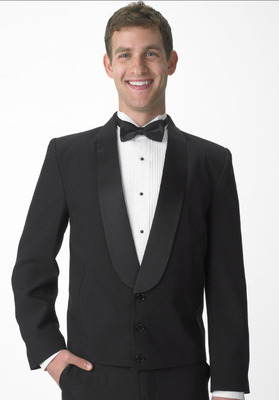 We offer many pant fabrics for your wait staff help including Poly/Wool, Microfiber, and Poly/Cotton. Each fabric results in a different look, depending on the application. We have ties for all occasions. Men's ties, bow ties and ladies ascots. We have women's Loop Ascots, Scarves and Tulips! Remember – your front desk is the face of your business and you need to be sure that every member of your front desk staff looks professional, feels comfortable, and makes the right impression with your guests. 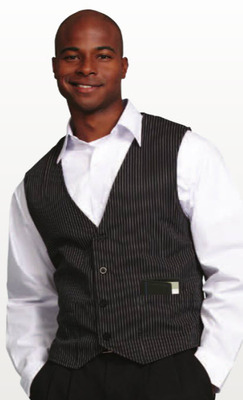 To help you do that, Sharper Uniforms is proud to offer a huge selection of hotel uniforms, including front desk uniforms, mens polo shirts, and more specifically designed to outfit the male members of your front desk staff. 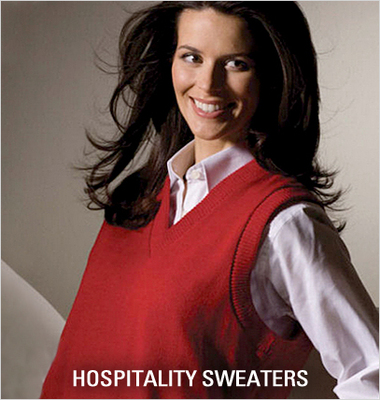 From mens polo shirts and sweaters to crisp pants and shorts, Sharper Uniforms carries all of the essential hotel uniform components so that you can make your front desk staff look prepared, professional, and polished. No matter what the level of formality at your hotel or resort, it’s easy for you to find the right hotel uniform for your front desk staffers when you shop at Sharper Uniforms. Make sure that you’re making the right impression with your hotel guests. 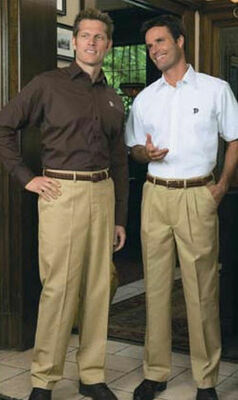 Let our mens polo shirts, sweaters, ties, pants, vests, and jackets outfit your male staff members. 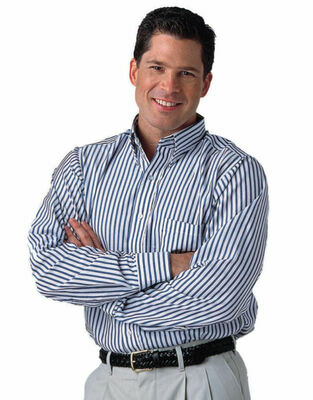 A classic, crisp, traditional, men's button-down shirt in a convenient, no-iron material! True "no-iron" performance - straight from the dryer! 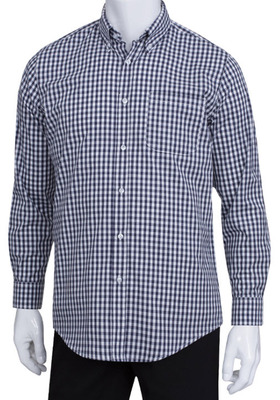 Great gingham shirt for the men servers! 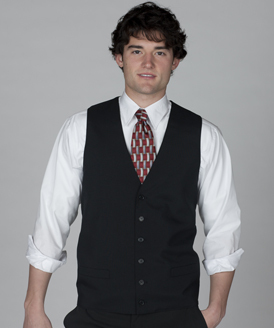 High performance sophistication in an easy-care, washable vest! High Button Poly/Wool Vest. Fantastic Poly/Wool vest! The fabric gives a spectacular full bodied look, which you can not achieve with 100% Polyester. Performance pants in a washable, colorfast, wrinkle resistant fabric! 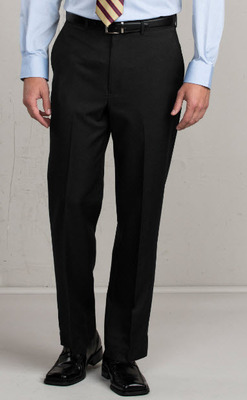 Men's Poly/Cotton Utility Chino Pant - Free Hemming!